The technology of railway signalling equipments requires the highest level of safety and durability. The comliance with these requirements can be raised by using oilhydraulic devices. The Alcatel 825 type electrohydraulic railway point machine is one of the best products in the market. The locking frame for rod gear can be used with or without checking bar as well, and the opportunity of installation is granted both of right or left side. The torque of the driving motor is converted into rectilinear motion by a closed hydraulic system. Since friction clutch is not used, only a very few mechanically moved parts can be found in the point machine. 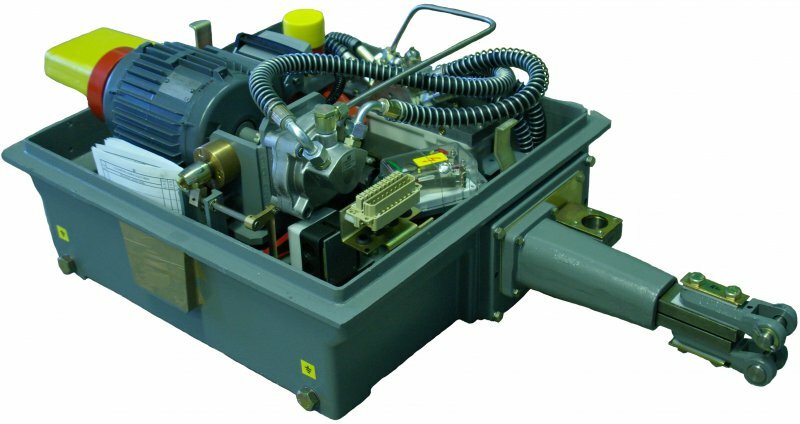 The 825 H typed model is for adjusting railwas point machines with a 220 mm stroke. The case of the electrohydraulic point machine is made of grey cast iron, which is resistant of splashing water and the its locked with a steel-plate cover. During the adjustment proccess the motor drives the pump int the right direction by the clutch. Cégünk az Alcatel váltóhajtóművek gyártásán túl azok javítását és alkatrészeinek utángyártását is vállalja.